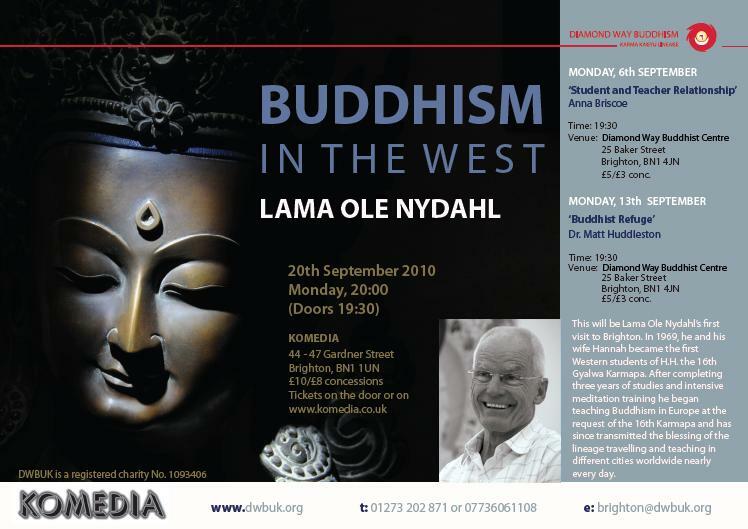 Lama Ole Nydahl will teach in Brighton for the first time on 20 September 2010. This is the advertisement for his lecture (click on image to enlarge). The lecture will give an introduction to Diamond Way Buddhism and its practical methods for discovering our innate potential for fearlessness, joy and active compassion. There will be time for questions and answers, a guided meditation with Lama Ole, and the chance to receive Buddhist Refuge and a blessing. It is possible to book your tickets online via the website of the venue. This entry was posted on Tuesday, August 31st, 2010 at 9:38 am and is filed under Brighton Buddhist Centre, Diamond Way Buddhism, Lama Ole Nydahl. You can follow any responses to this entry through the RSS 2.0 feed. You can leave a response, or trackback from your own site.